This game is the same as sudoku, except that the small groups are in an irregular shape. The object of this game is to fill in all the squares with numbers 1 to 9, the numbers in a row or a column must not repeat, and also the numbers in a group must not repeat. The faster you finish the game, the higher your score. When you are stuck, you can use the hints, but you will be penalized. A unique puzzle game that has 150 levels. The goal is to destroy all color blocks in all levels of the game by making similar colored blocks touch each other. The levels start very easy and slowley goes harder. There is also a level editor. Marbles Shooter is a new astonishing game for the puzzle aficionados. With three exciting game modes, great sounds and music, Marbles Shooter is an adventure you may not be able to pull yourself away from. 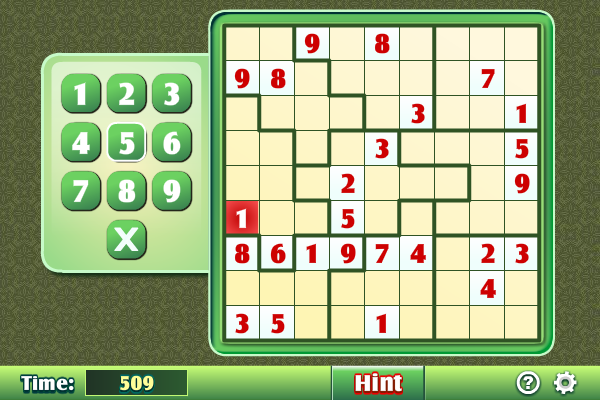 Sudoku puzzle game and solver for Windows. Hint features include scan, markup and reveal cell. You can also enter puzzles from newspapers and solve them, or see the solution. Sizes from 4x4 to 16x16 and difficulties from very easy to very hard.